Despite sharing one of two total words, "Day Drinking" is actually nothing like "Night Drinking" (also referred to by some as "drinking"). There are many unique considerations not encountered while Night Drinking. Let's say you're starting with brunch at 1pm, which means you'll be pretending to enjoy your first gross mimosa (more like a mi-gross-a, amirite?!?! No, iamnotrite.) by 1:15pm. Now is the time to start thinking about the future. If you put yourself on the proper path to really getting to know a cheesesteak at 8pm or so, you're looking good. But getting there the right way is critical. 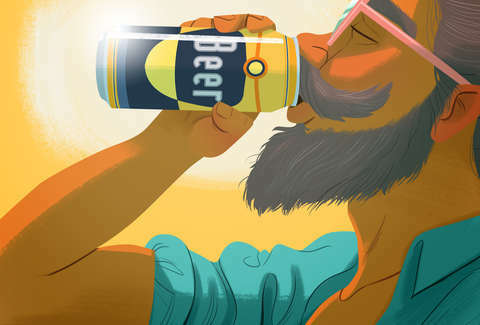 The most important area of focus during your Day Drinking is not, in fact, the drinking; that part's fairly easy. It's the eating. Proper eating will be your buoy through the day and ensure you remain the kind of person others aren't ashamed to be seen with in public, amidst all sorts of boring sober people who will spend their afternoons shopping for infinity scarves at Coldwater Creek. Far more importantly, it will provide the foundation for a (reasonably) hangover-less next morning, allowing you to go to the gym/office/local water park all bright-tailed and bushy-eyed. The second is especially true if you are Sam Waterston. Once you decide you will be Day Drinking the following day, it's very important to be at least reasonably intelligent the night before. Drinking to Cope With Hangover Drinking is a drastically different kind of Day Drinking altogether, and a very dangerous one at that. In an attempt to eradicate said hangover, you will almost certainly drink too heavily out of the gate, threatening your stamina. Ultimately, you will only succeed in rolling your hangover over to the following day while adding additional hangover to the initial hangover. The worst part is, at some point you will have to stop drinking to cover up the rolled-over hangover(s). Have foresight and consider your painful future. With all this in mind, do not stay out Night Drinking until 3am. A reasonable number of beers after work or at dinner is totally fine; you can even throw in a shot or two if it's early enough and George Thorogood is insisting you do so. Show enough restraint to avoid waking up underneath your futon with your chinos on and you will be rewarded. Brunch is basically a made-up meal specifically designed to encourage Day Drinking and coat it with a thick glaze of classy, because rich people and Sarah Jessica Parker do it. 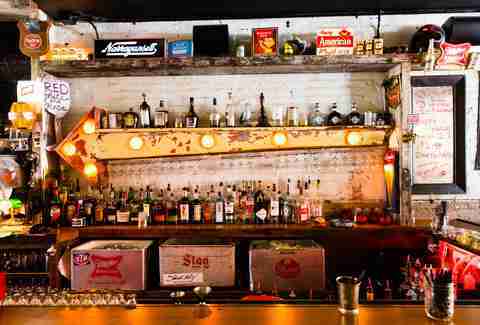 This Day Drinking Guide strongly recommends brunch. It's the perfect setting to establish a strong base of food and booze, and sometimes they'll let you sit outside while doing it (more on the importance of that later). Generally speaking, there are two kinds of brunch: 1) bottomless-booze brunches that will serve you two hours' worth of mimosas that are mostly just generic orange juice from concentrate and/or bottom-shelf Bloody Marys that might also be from concentrate, and 2) regular brunches, which are nothing more than meals at a restaurant willing to serve eggs later than normal. These typically include one free drink in the aforementioned offensive mimosa/Bloody category, or possibly zero free drinks at all. Bottomless-booze brunch can be the best, just not for your purposes today. The people at those brunches are not Day Drinkers; they're Brunch Drinkers. After their two hours are through and they head out for "one more," they will inevitably be derailed by the after-effects of overconsumption while attempting to find Ultra Strength Rolaids to combat the OJ-induced acid reflux that will eventually cripple their bodies. They are not in it for the long haul. You are. Also, nothing will set you up more for the very-next-day hangover we're trying to avoid than Andre Champagne and whatever kind of "vodka" Andre's brother Popov makes. Regular old breakfast food. Don't try to get cute here with the triple cheeseburger or the bowel-angering huevos rancheros from a "New American" restaurant. Consume eggs, potatoes, and bacon. If someone doesn't want their potatoes or bacon, take them and eat them. Even if you eat everyone's potatoes and bacon, you will still not be terribly full, which means you will be ready to drink more. If someone doesn't want their eggs, do not eat their eggs, as that is much grosser for some reason. Two drinks, maximum. Remember, you're not doing the all-you-can-drink, because you listen to me, which means you'll only be there for an hour or so. The most dangerous thing that can happen during that hour is succumbing to the classic hair-of-the-dog over-drink. Need an extra couple because you're feeling crappy? Apparently you didn't listen to me! Or the Night Before section. But even if you didn't, it's too late for that now. The main point is, you can't drink your way out of this hole all at once. The food will help, and the two drinks will help more. By the end, you'll find yourself smiling without trying, and actually participating in conversations. You're back to normal and set up for a solid slate of Day Drinking. NO SHOTS AT BRUNCH. No shots at brunch. Just, never do that. Shots at brunch are the Day Drinking equivalent of removing your football helmet and pads before running a crossing route in front of Ronnie Lott. You're trying to impress people by being the crazy guy, and when you do it Ronnie Lott probably won't even destroy your entire body because he had other coverage responsibilities at the time. But eventually, at some point in the day, when you least expect it, you will end up getting absolutely physically ruined by Ronnie Lott, become unable to think, and will feel the overwhelming need to vomit into someone's shoe. There's simply no upside. Congratulations. You've left behind all the people who think drinking two pitchers of mimosas is a grand idea just because it's cheap and have made it to a nearby dive bar with a strong daytime happy hour. This is a fine place to be indeed. 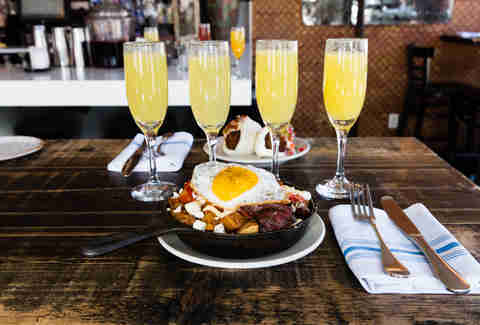 At this point, at least two people in your Day Drinking group will be complaining that they spent more money on brunch than they would have at the bottomless option, and yet drank less. The last thing they need is additional sticker-shock at a high-end bar. Buy a bucket of nice cold domestic beers and plop it on the wobbly table that needs some coasters shoved under one leg. This will 1) shut everyone complaining about money the hell up, because you just bought them a beer, and 2) begin a cycle of mass drinks-buying that will net you at least two more beers. You can never expect the full five to come back around, because people will lose track of who bought what (acceptable -- they are drinking), and other people will use their entire time plotting to avoid buying a bucket through various means (not having cash, "getting you back later, brah," simply waiting and waiting until someone else does even if it's technically their turn) and will succeed. But that's the way the world works. These people will likely be horrendous company in many other ways as well. With any luck, they had shots at brunch and are about to get Ronnie Lotted. But for you, sit back and enjoy the relatively daytime emptiness, the random small-conference college sports on the TVs, the downtrodden regulars for whom Day Drinking is a depressing life fact (and not an enjoyable activity you read helpful guides about), and not-quite-ironically playing the Len song "Steal My Sunshine" on the internet-connected jukebox. Once the rotation, however incomplete, swings back and eyes turn to you to buy another bucket, it's time to go. Nothing at all, unless it has a little bowl of free peanuts on the bar, in which case, continue eating said peanuts until the bartender refuses to refill the bowl a 14th time. They will load your body with hangover-battling vitamin B without taking up any meaningful amount of valuable stomach space. It's time to sit outside! Sitting outside while Night Drinking is not nearly as fun as sitting outside while Day Drinking. Sitting outside while Day Drinking drops you directly into the natural flow of the Sober-People World without you running the risk of being absorbed into that horrible place. You can watch The Sobers pick up their dry cleaning and go to the hardware store to replace their standard light bulbs with LED light bulbs whose wondrous efficiency will surely keep the polar bears alive, while safely being the exact kind of person who isn't going to worry about that crap until tomorrow, or possibly even later than that. Everything is far more enjoyable when you can juxtapose yourself against someone whose life is dripping with misery. One way to keep your Day Drinking interesting is to sit outside a restaurant instead of a proper bar. This will allow you to temporarily masquerade as someone who is simply having a snack at a reputable establishment in the mid-afternoon, as opposed to someone so hell-bent on systematic alcohol consumption that you read Day Drinking guides on the internet. Order whatever drink you would order if you were on a beach or in some other sort of tropical environment -- a nice refreshing Pilsner or kölsch, a margarita if you're feeling like a 43-year-old divorcee, hell, even a clear-bottled Mexican beer with a lime. The idea is to flaunt your outside-ness as much as possible and drive the aforementioned passersby into a state of consuming jealousy. If they have even the least bit of intelligence and sense of self-respect, they will drop off their LED light bulbs at home WITHOUT EVEN INSTALLING THEM and suddenly appear at a table next to you within 20 minutes. 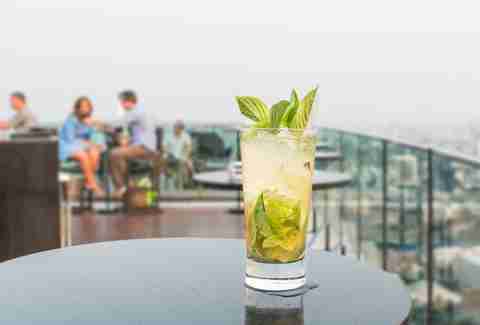 Your mojito has done the world a great service indeed. As mentioned above, it's also time to do a little light eating -- nothing so heavy that it would impede further alcohol consumption by dominating your stomach's real estate, but hey, sitting and JUST drinking for any extended period of time can be dangerous. Especially considering that a huge purpose of this Day Drinking guide is to prepare you for tomorrow. Shared bar foods are best here: nachos, wings, maybe some onion rings. If you get a little loose and order a hot dog, the world will not end (unless a massive asteroid happens to impact the planet at the exact same time you order a hot dog, which is unlikely), but avoid overly filling burgers at all costs. Don't worry -- there will be burgers later. 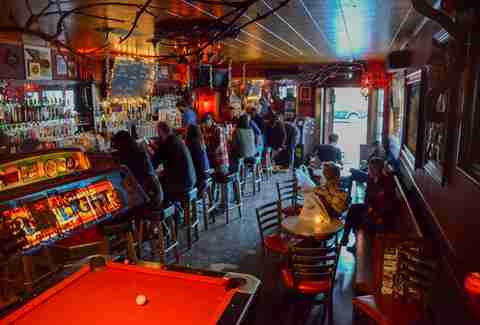 Moving to another dive bar may seem repetitive, but let's face it -- at this point, even if you've been following all the Day Drinking rules laid out thus far, things are going to begin deteriorating. You want to be in an establishment whose patrons are in a similar state. Day Drinking is not about impressing your group with wine bars peddling $32 flutes of cava, or fancy cocktail lounges whose ice was harvested from the Arctic Circle in 1972 (great ice year, 1972). Never forget: Day Drinking is about spending quality time with good friends, and that's it. All of the pretense that periodically drives Night Drinking should be stripped away. The idea is to talk about life and local sports teams and future plans to go on a road trip that will definitely never happen -- not elderflower liqueur. More beer. At this point, beer will act to fill up your stomach to the point where you don't even really want that much more beer. This is good; it's time to start slowing things down. Also, much like at brunch, NO SHOTS. You've been drinking for almost five strong hours now -- you certainly don't need them, and they will only serve to cripple your will to live/work/go see your friend's new baby you keep not seeing, come the next morning. When someone inevitably attempts to order a round of whiskey shots, discourage them by showing them this guide. They can even feel free to text me asking if shots are OK, and I will text them back telling them they are stupid. I would say some more of those free peanuts, except nobody is lucky enough to just happen into two bars and have them both provide free peanuts. Water. Seltzer. Gatorade. 10-K, if you stockpile really old sports drinks. More water. More water than that. One domestic light beer, maximum. You will not find most of this fun in any way, but it couldn't be more essential to laying the foundation for a reasonable physical and mental state the next day. A burger. Maybe that cheesesteak I promised earlier. Possibly entire loaves of bread. A chicken Parm sandwich doesn't sound like a bad idea. 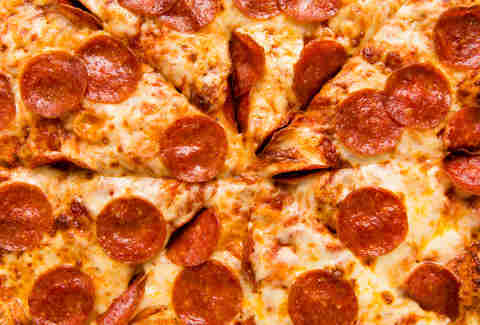 Pizza is obviously an option. Whatever you choose, be sure to fill your stomach up nice and good. This will both soak up the booze (if you believe that actually works, and I do, if only because it's the best excuse ever to eat all this stuff) and also push you toward a state of earlier-than-normal sleepiness that will provide the bedrock for your recovery tomorrow morning. That's it. The Day Drinking is over. Now you go to sleep. Fill the largest vessel that won't spill with more water and place it on your Grönkulla nightstand from IKEA. If your friends text you to come out that night, ignore them. Don't even consider texting them back with excuses, because they will not listen to those excuses, and you will inevitably meet them for Night Drinking until 1am and ruin all your hard work throughout the day. And that, friends, is your Day Drinking guide. Go forth and Day Drink. Ben Robinson is Thrillist's chief creative officer, and is way too busy loving sleep to do any research on a Morning Drinking story. Follow him home by 8pm (although to your own home), and also @BenjoRobinson.